A team of Chinese and French speleologists have determined that China's longest cave is around 186 kilometers long, 25 kilometers longer than a measurement from 2014. 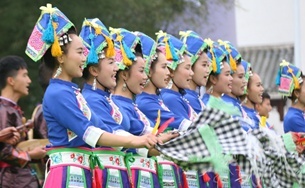 Tourism promotion activities kicked off in Liping county, Miao-Dong autonomous prefecture of Qiandongnan in Southwest China's Guizhou province, on April 28. 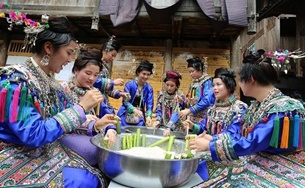 People of Dong ethnic group make bamboo rice during a celebration of bamboo rice festival in the Dong village of Wugong, Rongjiang county, Southwest China's Guizhou province, May 3. 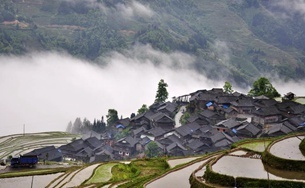 Photo taken on April 30, 2016 shows the terraces shrouded by morning fog in Congjiang county, Southwest China's Guizhou province. 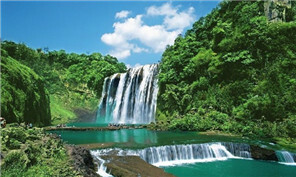 Guiyang has taken a number of measures to develop its big data industry in recent years, local officials said. The 2016 Guizhou Education Fair was held in Hanoi in Vietnam on April 27. 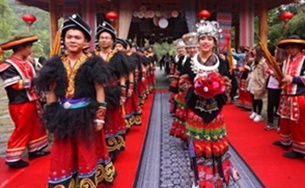 A group wedding in Miao ethnic style for 10 couples was held at a Dong's village in Xiaochehe Wetland Park in Guiyang, capital of Guizhou province, on April 27. As internet heavyweights scramble to expand online healthcare, a tech company in southwestern Guizhou province is aiming to carve out a unique presence for itself in the fiercely competitive industry.